Home Others Pokémon GO Creator’s Twitter Account Hacked — Pika, Pikaaaa! Pokémon GO Creator’s Twitter Account Hacked — Pika, Pikaaaa! This time, it’s Niantic CEO John Hanke, the developer behind the world’s most popular game Pokémon GO. And it seems like Hanke is so busy with its newly launched game Pokémon GO that he hasn’t noticed or took any measures against it even after over 12 hours of the hack, as the tweets made by hackers are still displaying on his Twitter timeline (at the time of writing). 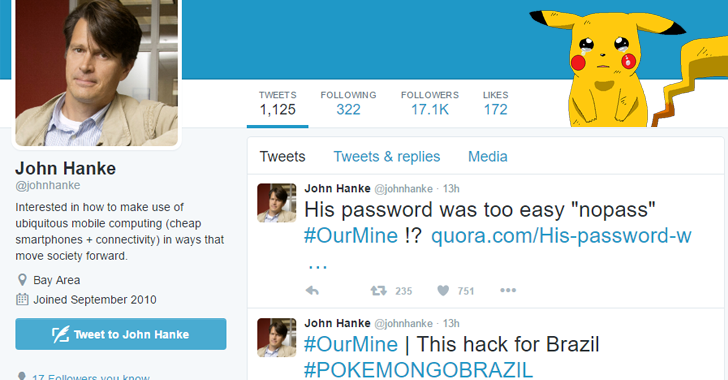 OurMine claimed responsibility for the hack, which was spotted after the hacking group managed to post a series of messages on Hanke’s Twitter timeline. It appears that OurMine managed to post on Hanke’s Twitter timeline after hacking his Quora account. Pokémon GO has become the world’s most popular mobile game and people are getting crazy to catch ’em all. The location-based augmented reality game allows players to catch Pokémon using their device’s camera and is officially available in only a few countries. Another tweet claimed that Hanke’s password was "nopass."